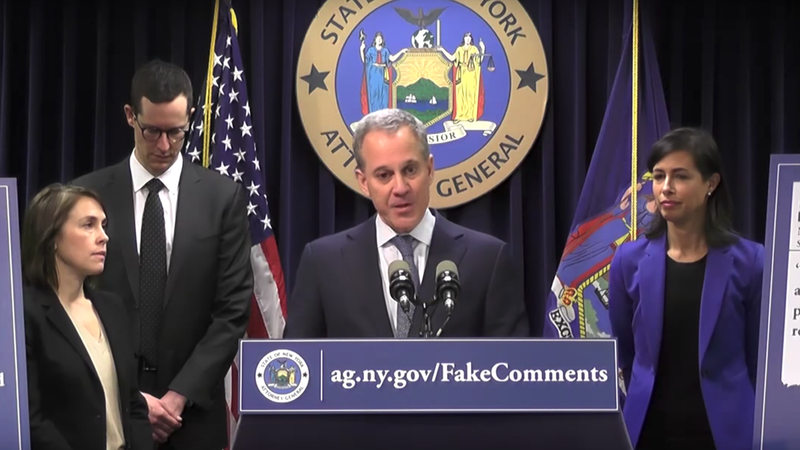 In a surprise twist, New York Attorney General Eric Schneiderman announced on Monday that FCC officials charged with investigating incidents of fraud have agreed to cooperate with a law enforcement investigation into potentially millions of fake comments submitted using the FCC’s website this year. On Monday, Schneiderman estimated that, in addition to swarms of apparently computer-generated names, as many as one million comments were submitted using real people’s identities without their knowledge. “That includes as many as 50,000 people here in New York,” he said. Although this likely constitutes a violation of state law, Schneiderman asserted, the FCC has repeatedly stonewalled all efforts by the New York officials to investigate the use of stolen identities. After learning that Schneiderman intended to hold a press conference on Monday afternoon alongside FCC Commissioner Jessica Rosenworcel, the FCC Office of Inspector General reportedly contacted the New York attorney general by email and offered its assistance with the investigation. Current and former FCC officials, who spoke to Gizmodo this summer on condition of anonymity, said the FCC’s IT staff had been directed not to try and filter out potentially fake comments submitted during the net neutrality proceeding. According to the sources, Chairman Pai’s staff had expressed concern that any attempt to block fraudulent comments would result in accusations that Pai was working to censor net neutrality advocates. Without the FCC’s help, the New York Attorney General’s office recently launched a webpage that allows Americans to search the FCC comment system to find out whether their identities had been stolen. “In less than a week, we’ve received more than 3,000 responses from across the country and they continue to come in,” Schneiderman said. For example, Schneiderman said his office had been contacted by the father of a 13-year-old girl from Rochester, New York, whose name and address had been used to submit a fraudulent comment regarding net neutrality. And the son of a woman from Albany contacted Schneiderman’s office, he said, to report that she had passed away a month before a comment in her name was submitted. “Even right here in my office, my assistant press secretary, Rachel, had a phony comment submitted under her name using the address of her childhood home,” Schneiderman said. The FCC is scheduled to hold a vote on December 14th over an order to replace and repeal the 2015 rules enforcing net neutrality. The order effectively abdicates the commission’s authority to regulate internet service providers (ISPs), such as Comcast and Verizon. Under the open internet rules passed two years ago, ISPs are required to abide by the principles of net neutrality: The companies must offer consumers equal access to online content and services and are prohibited from blocking or slowing traffic to websites at their discretion. As Republicans currently hold a majority of the FCC’s five seats, the order to repeal the net neutrality rules is expected to pass. Twenty-eight US senators have asked that the vote be postponed due to the allegations of fraud dismissed by Chairman Pai. “While I fundamentally disagree with the merits of the FCC’s proposal, what is equally concerning is the lack of integrity to the FCC’s process that has led to this point,” said FCC Commissioner Rosenworcel, a Democrat.